So right about now you’re probably wondering where in the world is Tri-Valley? Almost every time we mentioned to friends that we were traveling to Tri-Valley for a Northern California weekend getaway, we received blank stares and the questions of where is Tri-Valley, and what is there to do there. To be honest, other than knowing of the city of Livermore because my stepdad lived there for years, when I visited the Tri-Valley booth at the San Diego Travel & Adventure Show, I really knew very little about the region, but I was intrigued, especially when I learned it has one of California’s oldest wine regions. Tri-Valley is a grouping of charming California towns in Northern California only 33 miles east of San Francisco and within easy traveling distance from the Oakland and San Jose airports. Tri-Valley is called the sunny side of the bay because even with its close proximity to San Francisco, the hills that separate the valley from the bay mean the Tri-Valley area is usually warmer and drier than its neighbor to the west. Tri-Valley is also near Silicon Valley, meaning it has large laboratories and company campuses, with business travelers traveling to the area during the week. 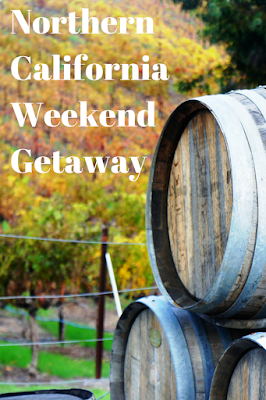 But the Tri-Valley area offers a lot of things to do for the weekend traveler, including wine country, a beer trail, museums, shopping, and world-class dining, making it the perfect Northern California weekend getaway destination. Livermore Valley is one of California’s oldest wine regions. There are currently over 40 wineries in the Tri-Valley area, most located in Livermore. Many of the wineries are small, some in the middle of grape vineyards and others located in industrial parks. Other wineries are large, like Wente and Concannon, which are also the oldest wineries in the region, being the only survivors of Prohibition. We visited Charles R Vineyards, Big White House and John Even Cellars and Tasting Room, and Wente Vineyards Estate Winery & Tasting Room in the middle of Livermore’s vineyards and Nottingham Cellars in a Livermore business park. A very unique experience is the winemakers blending experience at Wente’s Winemakers Studio. We took the two hour class where we learned the intricacies of tasting wine and then tasted seven different wines before coming up with our perfect blend specifically designed for our personal tastes. Tri-Valley doesn’t just have wine. It also has craft beer. Tri-Valley has joined the craft beer movement with a number of new craft microbreweries and brewpubs. Visitors can make a game of beer drinking by downloading the Tri-Valley Beer Trail Passport and visiting 10 of the 15 participants, getting stamped, and turning in the passport for a Tri-Valley Beer Trail t-shirt. Ten locations might be a bit hard to fit into just one weekend getaway, so save the passport for the next weekend vacation. We visited Working Man Brewing Company and Three Sheets Craft Beer Bar so we could experience one of Tri-Valley’s breweries and one of their beer pubs. The Tri-Valley breweries are crafting quite a diverse and exciting collection of craft beers. There are a handful of museums throughout the Tri-Valley area, like the Museum of the San Ramon Valley in Danville and the Museum on Main Street in Pleasanton, but the museum you must visit, whether or not cars are your thing, is the Blackhawk Automotive Museum. The Blackhawk Automotive Museum isn’t just a room filled with old cars. It has been likened to a display of sparkling jewels. When we walked through the entrance we were struck by the enormous room of shining black floors, black walls, and black ceiling, filled with jewel-toned automobiles shining under the spotlights. The car museum contains international automotive treasures described as rolling sculptures. I am not a car enthusiast, but I enjoyed walking through the aisles of cars, examining the glowing colors, and imagining riding around in these vehicles through the eras and countries from which they came. Romeo, on the other hand, is a car enthusiast, and could have stayed for hours, and would have returned the other days too. Cars aren’t the only items on display at the Blackhawk Automotive Museum. A special exhibit on during our visit was the European Train Enthusiasts: Operating Model Train Display. This is an exhibit that has been returning to the Blackhawk Automotive Museum for 14 years during the holiday season. This year they started an interactive component. We answered ten multiple choice questions on a card plus a bonus question based on our observations of the various displays along the model train route. A drawing will be held and the winner will receive a year’s family membership to the museum. While this activity is geared for kids, it’s a whole lot of fun for visitors of all ages. We spent far longer in the exhibit than we would have otherwise, having fun counting farm tractors and looking for what musical instruments were being played near the hot air balloons, which had the added effect of making us notice intricacies of the display we wouldn’t have noticed otherwise. Other exhibits included a display of rolling machines of another kind, wheelchairs through the ages, an exhibit of the spirit of the old west, and an exhibit of juke boxes. Some of Tri-Valley’s towns have charming main streets perfect for strolling and shopping. Our first Tri-Valley shopping experience was along Danville’s Hartz Avenue. Hartz Avenue is lined with small shops selling unique gifts, antiques, and decorations, and at surprisingly reasonable prices. Many of the items would have been twice the price in San Diego, and I ended up purchasing far more than I expected, trying as hard as I could to stick with small items that could fit in my suitcase. I fell in love with Rick’s Picks a discount retail store filled with a hodgepodge of everything you ever needed, whether you knew you needed it or not. The shelves are full of fun bargains ranging from All Clad cookware, cowgirl boot slippers, and seafaring dog sculptures. You may even run into Rick while you’re shopping. A few doors down the street is Molly’s Pup-Purr-ee, a pet boutique opened by Tina in 1996 and named after her Welsh Terrier. It’s heartwarming that a cute little pet boutique has been able to stay in business for over 18 years. All of Molly’s Pup-Purr-ee pet products come from companies who treat their employees ethically and are chosen to promote the health and safety of our beloved pets. On the other side of Hartz Avenue is The Bloom Space Vintage, which sells recycled, repurposed, and renewed goods including jewelry, antiques, gifts, and home décor. Since we were visiting during the holiday season, they also had a number of cute and unusual Christmas decorations. The Bloom Space Vintage is new to the neighborhood, having only been in business for two years and in Danville for less than a year. Presence is a long-time resident of Danville at over 30 years. Presence sells gifts, collectibles, and home and seasonal décor. At the back of the store is a sprawling Department 56 Christmas village display. It’s up all year, but they update it each year with new releases. Sweet Magnolia is an antique store and also offers interior design services. The quaint store is located in an old 1920s home and we squeezed between furniture and displays, going from room to room treading on squeaky wood floors. Pleasanton’s downtown Main Street also offers a number of eclectic shopping options. Main Street is lined with trees and historic buildings dotted with specialty shops, wine tasting rooms, and restaurants. We window shopped along Main Street after dinner, but we couldn’t resist stopping in at Rick’s Picks’ Pleasanton location. Around the corner from Main Street is Meadowlark Dairy, which has a drive-thru window for purchasing milk, ice cream, cheese, and other dairy products. On Saturday mornings the Pleasanton Certified Farmers’ Market is held at West Angela Street and Main Street. While Danville and Pleasanton offer small specialty shops filled with unique gifts and one of a kind treasures, serious shoppers can also head over to the Livermore Premium Outlets to get their fill of name brand items. The Livermore Premium Outlets actually have one of the most impressive store lineups I’ve seen at an outlet mall, and I’ve been to many. Stores include Kate Spade New York, Burberry, Bloomingdales Outlet, Last Call by Neiman Marcus, and Saks Fifth Avenue Off 5th. The Livermore Premium Outlets are such a tourism draw there are even group bus tours to the outlets. The backdrop to the outlet mall is the rolling green hills of Livermore. It wouldn’t be a completely crazy assumption to think that the small towns of Tri-Valley might not have the most diverse selection of restaurants, but nothing could be farther from the truth. Some of the towns of Tri-Valley pride themselves on encouraging privately owned restaurants over restaurant chains. Not only are there unique restaurants with high-quality ingredients and inventive dishes, there is also a wide variety of ethnic restaurants serving cuisines from all over the world. Our first introduction to Tri-Valley dining was breakfast at Sideboard neighborhood kitchen and coffee bar in Danville. It was love at first sight. Sideboard is in a restored historical building with a pig statue out front, always a positive sign. Sideboard serves freshly made meals with organic, locally sourced ingredients. They also serve Blue Bottle Coffee, which is apparently THE coffee to drink when in the area. Sideboard’s baked goods are all freshly made. Their cinnamon rolls are tall, soft, and the perfect amount of sweet. The eggs benedict are made with homemade English muffins. One of Sideboard’s more unusual menu items is the breakfast salad made with kale, bacon, pomegranate seeds, poached eggs, and green goddess dressing. Sideboard is open all day. Diners can eat inside or at outdoor mismatched tables and chairs surrounded by heaters. Sideboard provides blankets and quilts for guests who need a little more warmth. If you’re visiting the Blackhawk Automotive Museum in Danville, lunch at the Blackhawk Grille is a good choice. Both the museum and the restaurant are located in Blackhawk Plaza. As we walked into the restaurant we were greeted with dark woods, stone, and behind the bar a flame burning against the wall. We snacked on some of Blackhawk Grille’s appetizers including oakwood-grilled artichokes with aioli, pan-seared crab cakes with smoked pepper aioli, and shrimp sizzling in tequila, lime, serrano peppers, cilantro, and honey. Ulferts Center in Dublin is a two story strip mall that contains restaurants serving cuisines from many different countries. In the United States, some of the best ethnic food is served in strip malls, so we tried two of the Ulferts Center restaurants. Pamir Afghan Food is a family-owned restaurant serving Afghan cuisine as well as some pizza. We started our meal with bulanee katchalu, a mixture of spicy potatoes, onions, and herbs spread between thin dough and pan friend. A yogurt sauce and cilantro chutney were served on the side. My entrée was mantu, steamed dumplings filled with ground beef, herbs, and onions and topped with yogurt and meat sauce and a sprinkling of dry mint. Romeo had chicken qorma, pieces of chicken in a spicy, creamy stew served with basmati rice and salad. We accompanied our meals with sheer chai, an Afghan milk tea that can be served either hot or cold which comes out almost pink in color. Another restaurant in Dublin’s Uflerts Center is Koi Palace, a very popular restaurant for dim sum. We arrived a half hour before the restaurant opened on Sunday morning. A few others arrived around the same time, and people started lining up about 10 minutes prior to opening. By the time we were halfway through our meal, there was a line outside waiting and we saw diners being guided to a separate dining area not attached to the main restaurant. The dim sum menu has well over 100 items. You can either order off the menu or just wait for the carts to come around and pick the items that look good. We were excited to see some familiar items from our trip to China like Shanghai-style soup dumplings and egg custard tarts, and we also tried some new items like shui mai, a dumpling made with shrimp, pork, mushroom, and crab roe. Koi Palace is also open for dinner and serves fresh seafood that you can see swimming in the tank before it hits your plate. So a foot massage obviously isn’t dining, but it can actually be part of the dining experience in a roundabout way. Foot Logic is also in the Ulferts Center and is the perfect ending to a good meal. After our dinner at Pamir Afghan Food we stopped in at Foot Logic and were treated to a 30-minute foot reflexology massage. Romeo has never had a professional massage in his life and has never had any desire to do so, but he decided to give a session of foot reflexology a whirl and not only enjoyed it, but is now open to trying it again! Some other restaurants in Dublin’s Ulferts Center include Yakitori West, Soho Café, Halu Shabu Shabu, Pho Saigon 2, Jim’s Kitchen Taiwanese Cuisine, Thai Basil Express, and Osaka Ramen. There is also a Hong Kong bakery, Kee Wah Bakery, and a Taiwanese snack shop, Snowflake. Oasis Grille & Wine Lounge is another one of Tri-Valley’s ethnic inspired restaurants serving Mediterranean cuisine. Oasis is a dark restaurant with an intimate feel, perfect for a romantic night out. We started our meal with pumpkin borane, an Afghan dish of pumpkin sautéed in olive oil, peppers and garlic and topped with a garlic-yogurt sauce. I dined on aushak, also Afghan, a dish made with leek and cilantro tortellini covered in a surprisingly spicy meat and yogurt sauce. Romeo had the Persian inspired Oasis mix grille which had a koobideh kabob and a sizzling shrimp kabob. Oasis also specializes in exotic cocktails. Zephyr Grill & Bar is located in downtown Livermore on First Street where you might see a horse drawn carriage ride by. Zephyr takes the holidays seriously. During our visit the restaurant was completely decked out in Christmas finery and Zephyr was featuring a holiday inspired menu. Of course I had to order the Christmas wreath salad with smoked chicken, toasted hazelnuts, dried cranberries, bleu cheese, apples, and pomegranate vinaigrette, all arranged into the shape of a festive wreath. Romeo had the molasses glazed meatloaf, an individual loaf made with house cured ground beef wrapped in bacon covered in a molasses glaze. We visited Posada for lunch on their one year anniversary. Posada started as a catering company, but also has a restaurant in Livermore. Posada is family owned and you will probably see Chef Eduardo Posada and his wife in the restaurant. The restaurant features contemporary southwestern cuisine made with local ingredients and paired with local Livermore Valley wines. We snacked on some southwestern tapas. My favorite dish was the BBQ duck on blue corn pan cakes served with red cabbage slaw. Posada serves an unusual spin on ceviche, theirs being made with wild caught salmon in lemon, grapefruit and orange juices. Another flavorful dish was the braised lamb flautas served with avocado and tomatillo salsa. Tri-Valley has more than enough activities to fill one weekend and a few more. We did a lot, but still weren’t able to experience all of what Northern California’s charming weekend getaway destination has to offer. There are also golf courses, hiking trails, and plenty more wineries, breweries, and restaurants to try. Tri-Valley is an easy and inexpensive weekend getaway for Californians, and travelers from farther out will want to include a few days in Tri-Valley’s quaint towns and wine country in their Northern California travel itinerary. Thank you to Visit Tri-Valley for hosting our visit to Tri-Valley and making this post possible. As always, all opinions are my own.